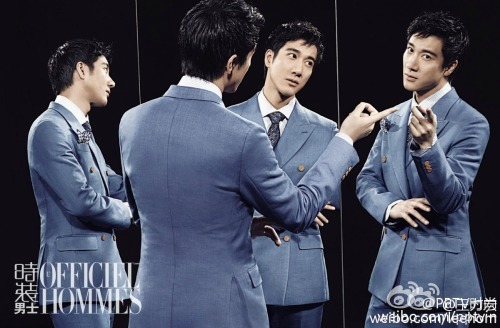 If there’s anything better than one Wang Leehom, it’s four Wang Leehoms. Here he is poking fun at himself in a recent photoshoot for L’Officiel Hommes. You! You! You! It’s not polite to point like that! Leehom also randomly started posting sheet music for his songs, starting with “Your Love” (你的愛), the title track from his new album. If you play violin, viola, cello, or bass, and have been dying to learn how to play his music, check out the link! Magician Lu Chen (also written as Liu Qian) announced his marriage to Wang Xiyi, who is reportedly a print media model, a previous member of UP Girls, and a third-generation descendant of the Family Li Imperial Cuisine restaurant business. She is 27 years old, ten years Lu Chen’s junior, and the two dated for two years before tying the knot. 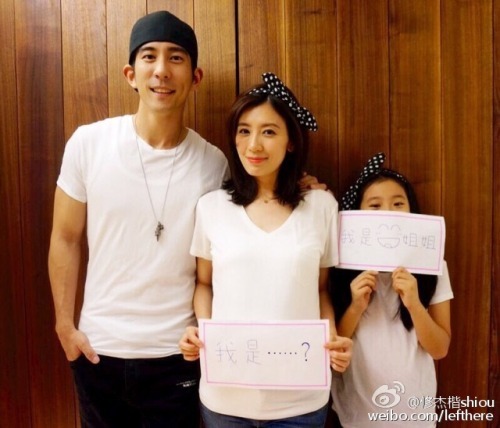 Taiwanese actor Xiu Jiekai also announced some happy news: he successfully proposed to actress Alyssa Chia last month in Japan, and the two are expecting a daughter! The couple posted some cute pics with Alyssa’s daughter from her previous marriage. She is currently about five months pregnant. Thanks to you, my little angel who has been with us this whole time. Together we welcome the arrival of another little, little angel~ Thanks to you, Mommy, thank you for letting me become the luckiest man~ I will use my luck and transform it into happiness, so that we all can have it together! Nicky Wu and Liu Shishi also have happy news! No, Shishi is not pregnant. They just got a dog, who is affectionately named “Xiaolongbao” (like the yummy soup dumplings that everyone gets at Din Tai Fung). Instead of the usual character for long (笼), however, they’ve replaced it with the long in Nicky’s Chinese name (隆). 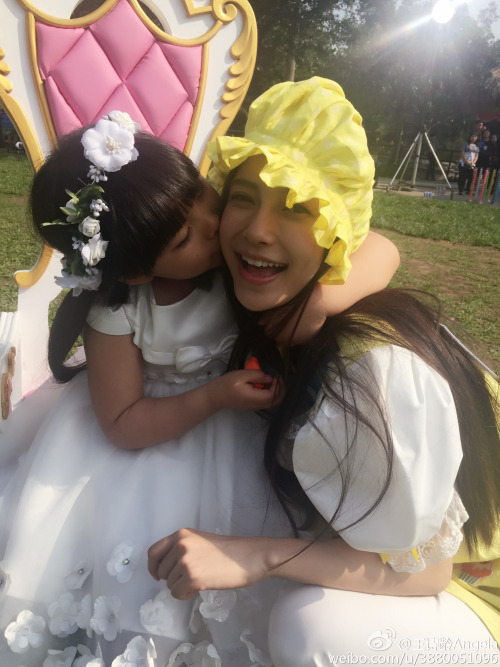 As for our slightly older kids, baby Angela and Angelababy pose for a cute photo together. 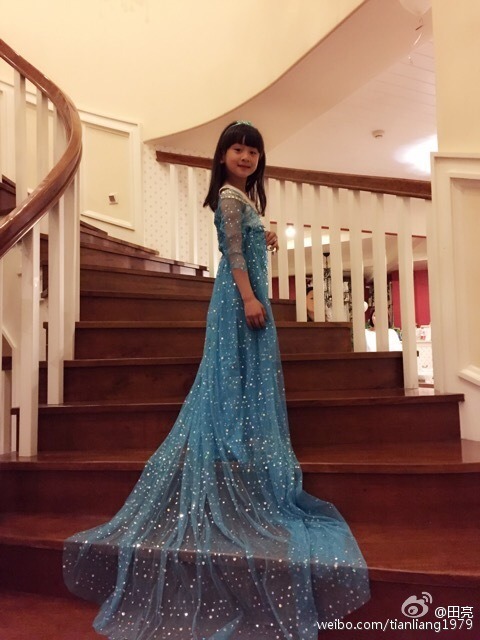 Tian Liang posted a photo of his daughter, Cindy Tian Yucheng, looking mighty like a princess in a beautiful long dress. A full-length dress, the paradigm of a goddess. She ran around in the house after putting this on, and the floors suddenly became much cleaner. Such a good child. 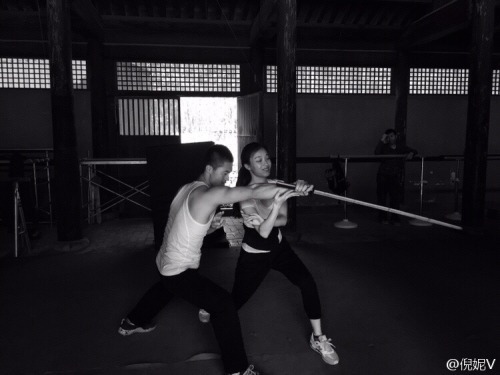 Ni Ni shows how ready she is to defeat the Huns as she trains for her new film Mulan The Warrior’s Gate (勇士之门). I think every martial arts master has to go through this stage on his road to a master. 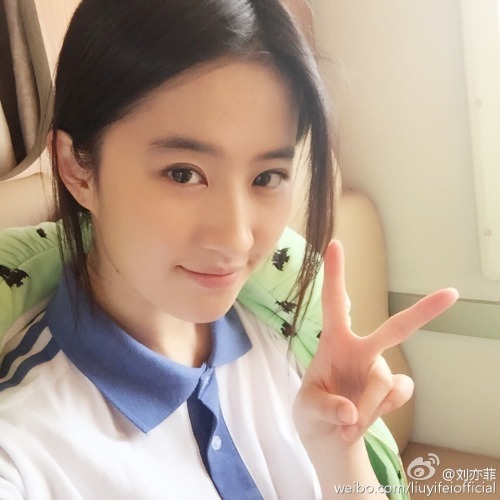 Crystal Liu Yifei gave fans their first glimpse as a high school student in Turns Out You Are Still Here (原来你还在这里), her movie with Kris Wu Yifan. Currently in the filming stages, Still Here is being billed as a sequel-of-sorts to 2013’s So Young despite its different cast of characters, since the source novel is also written by Xin Yiwu and the story deals with similar themes. For an example, just look at this group photo of Jason Fu of the former JL, Top Combine , and M.I.C., and how many people they’re missing. It’s so cute how they’re all friends with each other. Did you know that Jason Fu and Liu Zhoucheng were once roomies in college? Watch them in an interview together along with M.I.C.’s Steelo, where Jason continues to profess his love for Zhao Yongxin while Liu Zhoucheng introduced himself as “Top Combine’s Tan Jianci”. It’s funny that Zhao Yongxin said Jason Fu used to be obsessed with Chi Yuehan, because does anyone else think parts of Shaky Party were ripped from Yuehan’s Hangover Part 2? 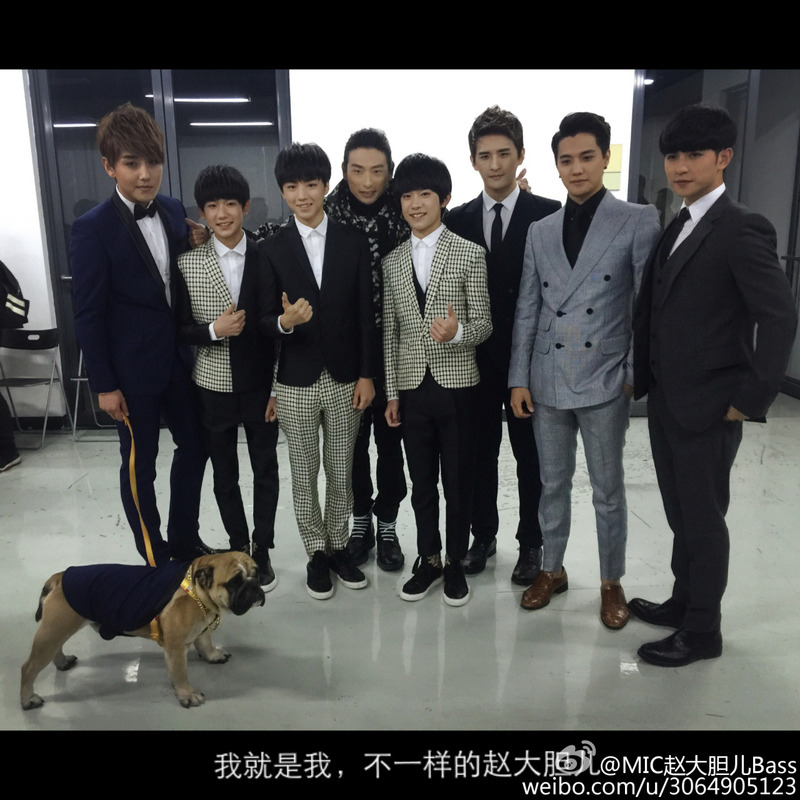 They’ve Joining the group is TF Boys in a group photo with Top Combine, director Ye Shaohu, and M.I.C.’s Steelo and Bass the dog. 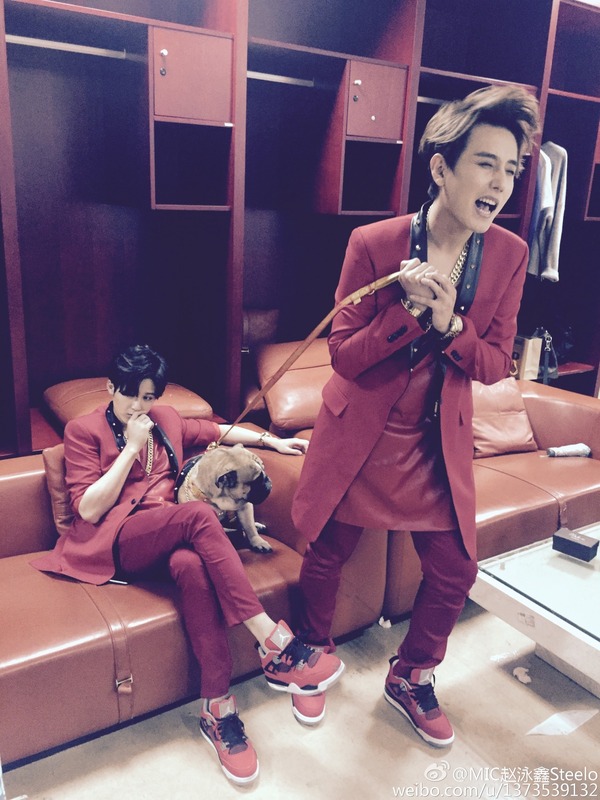 Yes, we’re now translating Weibo posts by dogs. 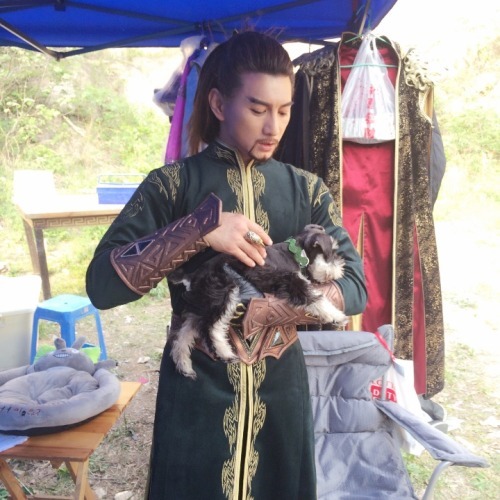 @MIC Zhao Bass: Do you know how hard it is to be a celeb dog? Just finished performing, met the three cuties from TF Boys, and got flirted at by the three hotties from Top Combine, but I still love director Ye Shaohu the best because he made Daddy super handsome in his MV! But daddy, where’s mommy? Yes, Tan Jianci, where are you in all the photos? The mysterious Tan Jianci showed up halfway throughout his and Steelo‘s duet and is gone from all group photos. He returned to Beijing especially for Steelo in the middle of Tiny Times the musical rehearsals three weeks before its opening. Here’s a fancam of the catchy song between him and Ma Haisheng’s Gu Yuan. As for Steelo, he was too caught up with his family reuniting to really care about the future of the music business. This entry was posted in Miscellaneous and tagged Alyssa Chia, Angela Wang, Angelababy, Cindy Tian Yucheng, Crystal Liu Yifei, Jason Fu, Liu Qian, Lu Chen, M.I.C., M.I.C. Jianci, Ma Xueyang, Ni Ni, Nicky Wu, Steelo Z, Tan Jianci, The Warrior's Gate, Top Combine, Turns Out You Are Still Here, Wang Leehom, Wang Xiyi, Weibo Wednesday, Xin Yiwu, Xiu Jiekai, Ye Shaohu, Zhang Yuan by Jo. Bookmark the permalink. 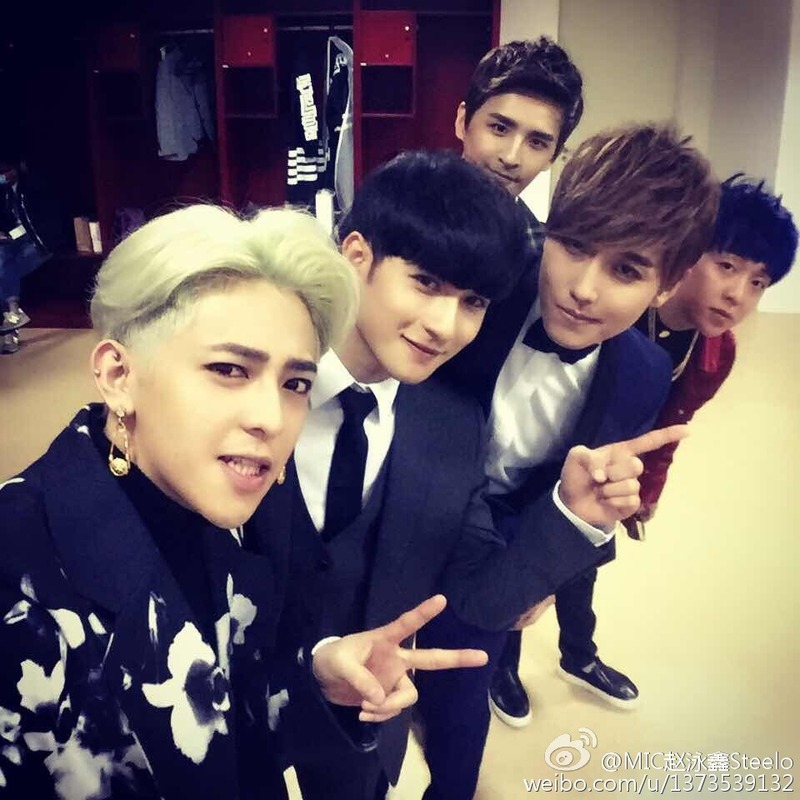 Is this the same Wang Xiyi who was on Happy Camp with Qi Wei and BoBo? It’s such a weird pairing, but best wishes to them! I don’t know why, but I always assumed that group members lived together. Interesting that Liu Zhoucheng and Jason are roommates. Also, Wei Chen posted thanking EE Media for the past eight years, too, I think. I really hope they don’t break-up. As much as I like them, I don’t think they’ll do better solo unless they have a significantly better company and get either really songs or be like Leo of JL and have really good roles.